The artist Wayne Thiebaud renders everyday delights strange and vibrant. Long celebrated for his peppy still life paintings and fantastical landscapes, the 96-year-old California native is currently in London for a survey show at the city’s White Cube gallery. It is the week of the Chelsea Flower Show, and the pale pink check of Thiebaud’s shirt echoes the vases of hydrangeas and other blooms displayed in the dining room where the artist sits for afternoon tea, in the Corinthia hotel, where he is also staying. 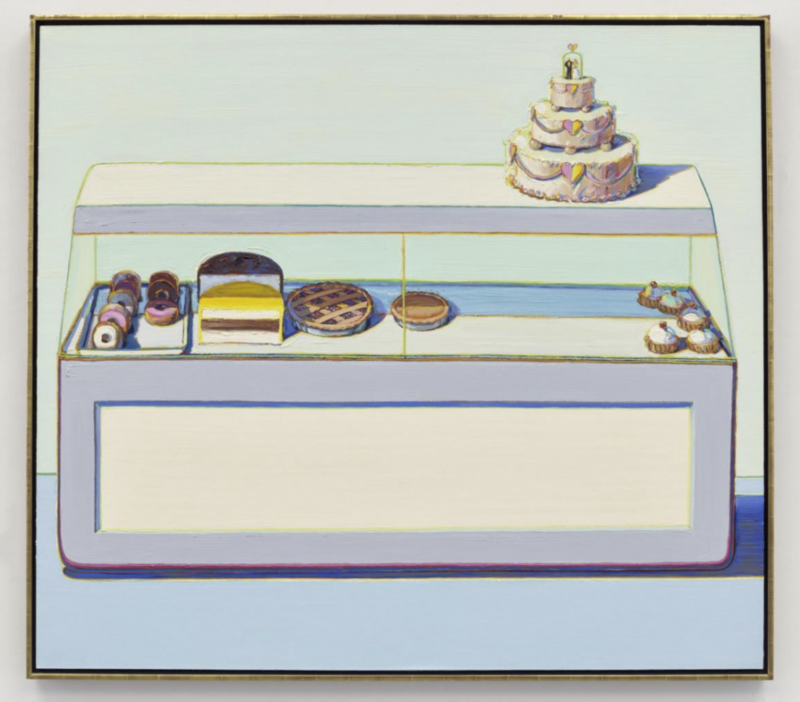 Food is a subject Thiebaud returns to often: That same pink also recalls the fondant fancies, wedding cake frosting, cotton candy and gumballs that he has painted with preternatural geometric discernment across many decades. Thiebaud worked as a cartoonist and commercial illustrator before serving in the U.S. Air Force during World War II. It was only at the end of the 1940s that he turned to study fine art. While influenced by the work of turn-of-the-century European artists as well as the artistic conventions of the Middle East and Japan, his graphic sensibilities and cartoonist’s wit informed his engagement with the aesthetic of everyday postwar America. He also counseled students not to judge their own efforts too quickly: “It’s difficult to see the work with any clarity until years later.” Thiebaud followed his own advice: The exhibition at White Cube features a number of paintings that the artist has returned to over the course of decades. Striking among these is “Green Dress,” a 1966 portrait of his daughter, the noted artists’ model Twinka Thiebaud. Thiebaud returned to rework the painting earlier this year.